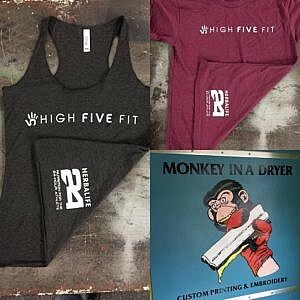 Ordering custom t shirts is now easier than ever when you work with the folks at Monkey in a Dryer. We use only the highest quality shirts for your custom printing jobs, and offer a wide variety of styles, sizes, and colors to best match the unique look you are seeking. 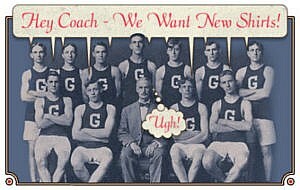 No custom-printing job is the same, much like no two monkeys are the same, and we get that! There are a number of occasions when people may find the need for custom apparel and we do our best to cater to all of these instances. Not only do we specialize in the occasions mentioned above, but we do our best to go above and beyond to meet all of our client needs. Not the creative type? No problem, my art skills as a monkey are severely lacking as well! We proudly offer design services to help you create your custom t shirts and other apparel. You can choose to design your own creation using our design tool or work with one of our talented graphic designers. Our artistic designers are the pros when it comes to whipping up creative and unique designs and can help save you the time and energy when it comes to creating your custom apparel. When it comes to custom apparel, pricing can be a concern and can get quite expensive. You may not know this, but as a monkey I am always on the look out to for ways to save money, because hey, bananas ain’t cheap! That is why I have helped the wonderful ladies at Monkey in Dryer put together this list on ten easy ways to save money on your next custom-printing job. We offer tips like using white or light colored shirts, printing fewer ink colors, using standard ink, and ordering in bulk, all of these can help you save some major dough on your next project. Want more information or have questions? We love to chat, contact us today to learn more! next post: Screen Printing Pricing, How Much is That Going to Cost?